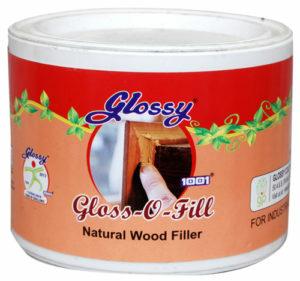 Gloss-O-Fill Wood filler is made with unique solvent free, eco-friendly formulation which helps it to set firmly to all wood types and does not fall, crack or shrink. All wood finishing systems like Laequer, Melamine, P.U. & Polyesters can be applied over Gloss-O-Fill wood filler easily. It fills the cracks, gaps and blemishes to give your furniture a flaw-less beauty. Before using the wood filler, make sure that the wood is clean of any dirt or debris, Fill cracks, holes and blemishes with a putty knife, Fill deep holes with multi layers of wood filler. 30% to 50% of water can be added to Gloss-O-Fill wood filler if required.